ProShop manufacturing enterprise software has earned the top “Frontrunner” ranking for June 2018 from the consulting, research and software evaluation firm Software Advice* , after being available publicly on the market for just two years. Developed by Adion Systems, ProShop benefits small- and medium-sized manufacturers by providing an integrated, comprehensive set of modules for managing a shop’s ERP (enterprise resource planning) operations as well as MES (manufacturing execution system) and QMS (quality management system) functions. Software Advice, a unit of global research and advisory firm Gartner, Inc., is a leading online software selection consulting service. The company’s Frontrunners rankings highlight the best software products for North American small businesses. ProShop’s top ranking for June 2018 results from Software Advice user reviews of more than 70 manufacturing software products, with scores based on published user product reviews on ease of use, and likely recommendation to others. ProShop is a comprehensive web-based shop management system for small to medium manufacturing companies. ProShop was built on the shop floor of a machine shop for nearly 20 years. ProShop is 100% paperless ERP/MES and QMS software for machine shops, fabricators, job shops, contract manufacturers and others in regulated industries that need tight controls on their process and want exacting and timely information to make the best and most profitable decisions. The story of Adion Systems and ProShop started in 1993 where the founders met at Western Washington University in the Vehicle Research Institute. During college they worked on designing and building racing cars for the Formula SAE competition. This shared sense of purpose to keep building things and working together as a team led to the creation of a subcontract manufacturing company, Pro CNC, that the founders grew for 17 years. To improve the operations and efficiency of Pro CNC, they developed ProShop – an ERP system to run their machine shop. ProShop handled their shop scheduling, shop floor control, quality management, CMMS, equipment calibration and much more. During the first 10 years they developed ProShop just for their own company with no plans to ever commercialize it. Customers, vendors and even auditors would tell them that ProShop was the most complete shop management software they’d ever seen. After hearing this many times, along with requests to buy the software, they researched the ERP market and decided to seize an opportunity to help manufacturers just like them to become more globally competitive. In 2014 they sold Pro CNC to an international manufacturing enterprise and established Adion Systems to continually improve, sell and support ProShop. In addition to typical ERP segments dealing with estimating, quoting and purchasing, ProShop includes MES and QMS control, monitoring and collection capabilities. 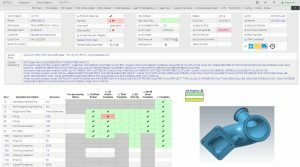 The MES function tracks machine usage, cutting tool management, work instructions, part inspection data and more, including ProShop-exclusive integration with coordinate measuring machine data. QMS functions include ISO-9000, AS9100, API and ISO 13485 modules, covering all the tasks required to comply with the different quality systems that may be in place at a worksite. Data regarding standards, equipment, users, training, audit reports, non-conformance reports and corrective actions are among the information included. ProShop may be hosted in the cloud or on site, depending on the user’s preference. One advantage to utilizing a cloud-based system is it can lower IT costs for companies. Most companies have limited IT resources who are best spent working on other things. Cloud ERP reduces the IT burden considerably, both on the initial setup, but also with ongoing IT support that would be typically needed for on-premise software installs, updates and maintenance. Cloud ERP is easier to scale as the company grows. Just add users and go. No software to install on their respective computers. Users can use any device with a web browser to access the system. Furthermore, updates are much easier. On cloud ERP, updates happen automatically, so customers are always on the latest version of the software with the latest features to help them run their companies. Any customization is done in a way which eliminates the possibility of conflicts with future releases and updates. You can access your ERP system from anywhere. Even on the road, or on a plane, you can access your system to see status of all jobs, update clients, approve documents, and much more. Cloud systems can be updated to the latest hardware without the company needing to do anything. No more slow servers that need updating and possibly crashing your system. Your data is always backed up to the cloud and risk of data loss almost nonexistent compared to on-premise servers. Will I lose my data? Not as likely as you are losing the paper copy, that’s for certain! With proper IT systems in place, company data is continuously backed up redundantly. The chance of losing data because of a server crash, fire, flood, or other disaster can be mitigated down to nearly zero. That’s impossible with paper systems unless a very costly system of duplicating all paper records is put in place. “ProShop can replace five to six separate software packages that may not communicate well with each other,” Van Metre said, adding that use of ProShop can positively impact profitability and throughput. Examples include moving overhead labor to billable functions, opening capabilities for more complicated jobs, improving on-time delivery performance and accurately estimating profit margins on each project. Implementation of ProShop enables more informed and conscious choices surrounding all business decisions. For more information browse www.adionsystems.com or call 360-515-7576. *The content for FrontRunners is derived from actual end-user reviews and ratings as well as vendor supplied and publicly-available product and company information applied against a documented methodology; the results neither represent the views of, nor constitute an endorsement by, Gartner or any of its affiliates.